The cheapest and easiest way to buy deciduous fruit trees is to buy bare root fruit trees. They are generally available from June/July through to August. They are cheaper because they are field grown and dug, the expense of pots and potting soil is eliminated. They are also very easy to transport and plant. 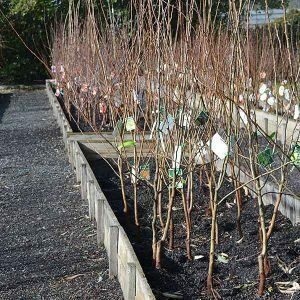 You can buy them online from reputable suppliers or from local retail nurseries who specialise is fruit tree. When you are looking to buy bare root fruit trees, look for a nursery that has gone to the trouble of preparing the tree for sale. The roots should be covered with soil, or other organic medium, and they should be moist. Planting Your Bare Root Fruit Tree. The secret to planting Bare root fruit trees is to prepare the soil well before, and to plant the trees as soon as you get them home. The roots should be covered when you buy them, usually in sawdust or similar. Dig the hole twice as wide as you will need it to be to fit the roots in. Amend with some well rotted compost a few weeks before planting. Avoid digging down into heavy clay soil. Either build up the soil above the clay, or look for a different position. With sharp clean secateurs prune of any damaged roots with a clean cut. Plant the fruit tree at a depth that it would have been before it was dug. Gently spreading the roots out. Backfill and firm the tree in well, creating a shallow dish around the plant to hold water. Secure the fruit tree to the stake. Water in with a liquid seaweed fertiliser. DO NOT add fertiliser to the planting hole, or the surface at this stage. Prune the plant as is indicated for that specific tree. Mulch around the tree to help create a cool moist root run. Generally all of the deciduous fruit trees are available as bare root types. These include. Bare Root Fruit Trees are available from the following Nurseries. Good range of Fruit Trees, Roses, Perennials and annuals. Includes Avocados for cold climates, persimmon and Olives.